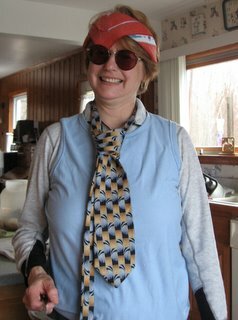 It has been a family tradition to celebrate April Fool’s Day with the kids by having a “crazy dinner”. 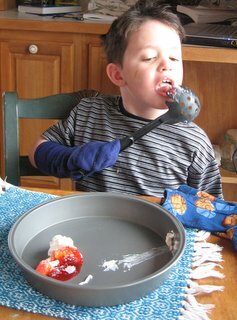 We dress up weird, eat our meal in reverse order (dessert 1st), and use kitchen utensils instead of normal silverware. For a 5 year old boy this is one notch below Christmas as a holiday and at least as fun as a someone’s birthday. 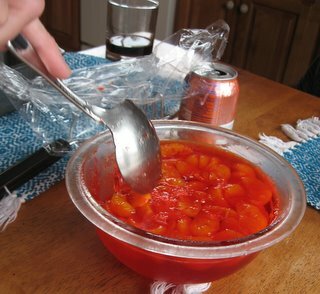 Jello is the perfect food to hone your kitchen utensil eating skills. 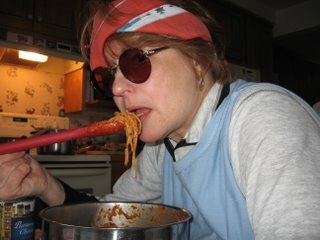 Our second course was, can you guess?, of course, spaghetti. A good time was experienced by all. Afterwards we took a short walk. 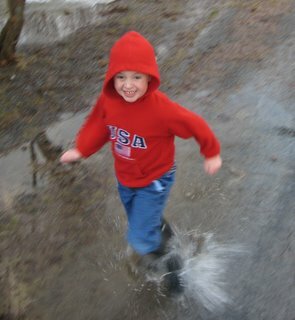 Nothing beats stomping in the puddles after an April Fool’s Dinner. Kathryn shows off her dinner attire.